Your students are asked to identify the unknown predator that is killing calves on a nearby ranch. A rancher found hair left behind by a suspect predator. Your studetns are asked to identify the animal responsible by comparing the extracted DNA to that of three known standard samples. Kit II: Allows students to amplify four DNA samples via Polymerase Chane Reaction (PCR) and observe visible bands via Agarose Gel Electrophoresis. Master mix (including primers and enzyme) and DNA ladder included. 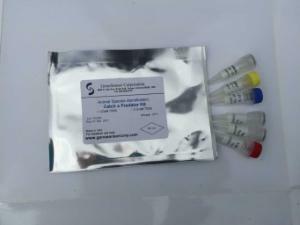 The kit includes four samples of DNA (plasmids). One representing the DNA of an unknown predator, and three representing known standards for comparison. Ordering information: Equipment needed but not included: Heat block/water bath for restriction. Thermal cycler for PCR, microcentrifuge; vortex for sample preparation. Electrophoresis equipment/reagents including transilluminator/light box for analysis. Kits come with directions to download instructional material and procedures.